There are so many reasons that we — Fil, Paul and David — at All Rolled Up enjoy working with our partners. As a small company creating a hand-crafted product, we value the close working relationships we can build with energetic and enthusiastic partners. Many of our recent innovations – like our custom printed neoprene dice trays – would be impossible without Patriot Games, in Sheffield, for example. We’ve tapped into the close proximity between our two companies and built something great from that. On a wider basis, the fantastic designs and materials we offer would not be possible without our partnerships that supply incredible artwork, like that of Billiam Babble – in our dungeon tile design materials – or Järnringen – with Symbaroum inspired designs. 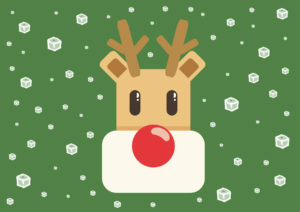 For the last two years, we have had a licence from Monte Cook Games to produce Tiny All Rolled Up (TARU) – a version of our core product focussed on the minimal gamer. Monte Cook Games range of Cypher system games – including The Strange and Numenera – harness a minimum prep approach to player-faced games, where a few dice and a couple of dozen playing cards are enough to fill an evening or a con game slot. Combined, the Numenera and The Strange TARU offers the essential gaming materials carried in style – with a range of designs. 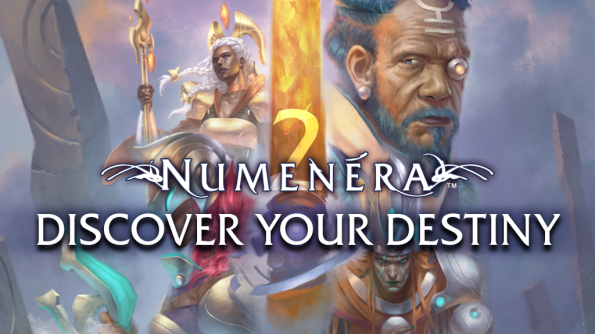 When we visited Gen Con this summer, we spent some time chatting with Charles Ryan about our product range and licence – and that con, MCG announced Numenera 2: Discovery and Destiny. Numenera 2 revisits the world first Kickstarted in 2013 with the Numenera core book and replaces that core – while remaining true to the overarching system that has developed over the last four years. The massive array of material published over that time – expanding the Ninth World in dozens of awesome directions – will be enhanced with the opportunity to unlock the potential of your characters and build upon the ruins of the future like never before. Last night, Charles, Sean and Darcy released a new Glimmer from the Datasphere to support the current Kickstarter that has funded in excess of 500% with two weeks to go. At the top of that video feed, Charles revealed the physical samples for the Numenera Player Kit – a brand new, Kickstarter exclusive Tiny All Rolled Up; a Kickstarter exclusive, personalised folding Dice Tray; and, a gorgeous and durable Numenera bookbag. That discussion at Gen Con – well, we had a lot of energy and enthusiasm from both sides. 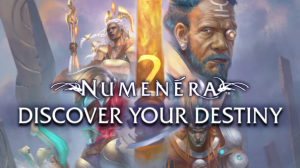 We love what Monte Cook Games do and they love what we do – and out of that, All Rolled Up and Patriot Games will be producing this fantastic add-on for the Numenera 2 Kickstarter. 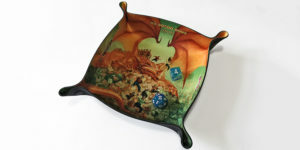 We will also continue selling our existing Numenera TARU designs – and have a pile of ideas of things to come; but, if you want these designs and the personalised dice tray, backing Numenera 2 will be the only way to do it. Check out the Kickstarter page for Numenera 2: Discovery and Destiny, read Update #40 on the Numenera Player Kit, and check out that Glimmer.